Nazi urban legends have been an endless source of inspiration for films. From their search for eternal youth in Indiana Jones And The Last Crusade, Nazi zombies in Dead Snow, to a Nazi colony on the dark side of the moon in Iron Sky. And what would a horror film festival like FrightFest be without a bizarre Nazi flick? Frankenstein’s Army is the Nazi film of the year. What’s it about? 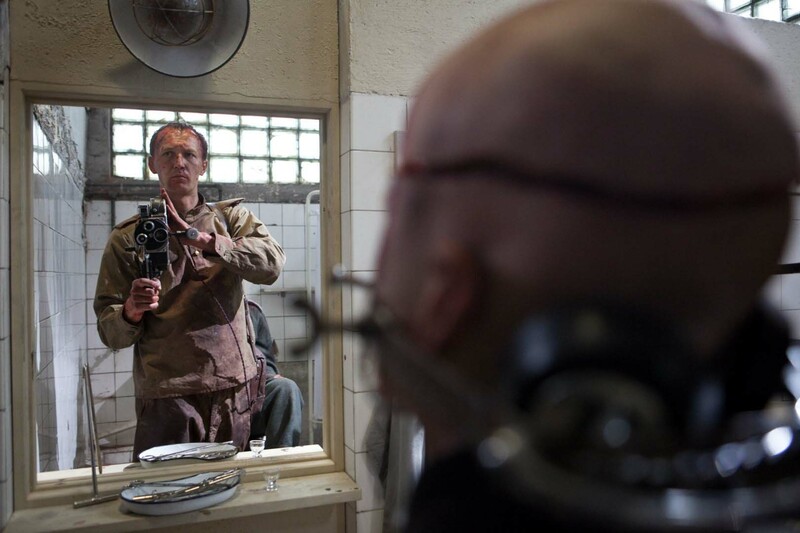 Towards the end of World War II, Russian soldiers pushing into eastern Germany stumble across a secret Nazi lab, one that has unearthed and begun experimenting with the journal of Dr. Victor Frankenstein. The scientists have used the legendary Frankenstein’s work to assemble an army of super-soldiers stitched together from the body parts of their fallen comrades. Verdict: The problem with the Frankenstein myth is that, nowadays, it lacks the terrifying factor the creature imagined by Mary Shelley originally had. Audiences have evolved and a monster as slow as Frankenstein doesn’t feel menacing enough in our fast-moving world. The found-footage style employed by director Richard Raaphorst also doesn’t work as well as it could. In the movie one of the soldiers films everything the group finds along the way, and the cast interacts with the cameraman making the audience feels included in the action. Found-footage as style can be an excellent tool to play with as a filmmaker, but Frankenstein’s Army doesn’t hide the editing tricks as well as films such as V/H/S/2 or [REC]. There are long supposed-to-be unbroken takes which are unfortunately broken with cuts. Many viewers won’t necessarily notice these problems, but the editing could have been handled better. On the other hand, Frankenstein’s Army is entertaining and filled with enough action and blood to compensate for its lack of true horror. Once the creatures start chasing the protagonists, guts, brains and other body parts splash all over the camera, bound to please blood and gore fans. The gore isn’t as heavy as the Hostel or Saw franchises, but there are some good bloody moments. But it’s in the art and technical departments that the film really excels. Director Raaphorst has vast experience in this area, having worked with directors such as Paul Veroheven. Frankenstein’s Army has a terrific look and the colors, lights and shadows created by cinematographer Bart Beekman are fantastic. From high and open spaces, to tight, claustrophobic corridors, and Hostel-style laboratories where Frankenstein plays God. Extras: The director worked hard with special effects and make-up teams to design a wide range of creatures who might as well have crossed over from the Silent Hill universe to this bizarre Nazi nightmare. The DVD extras include a feature on the making of the movie which explores these insane creations further and how the Star Wars trilogy influenced the design. Final words? A thrilling and interesting, but not quite terrifying enough take on the Nazi horror genre, worth watching for its fantastic design work. Frankenstein’s Army is out on DVD on 30 September 2013.